There are different varieties of checklists being used nowadays and each one of them has been proven effective. No wonder more and more checklists are being created and even more are being used by a lot of people in different industries. All checklists are significant and their significance depends on the purpose as to why they are being used. One of these significant checklists is an induction checklist. You may also like weekly checklist samples. 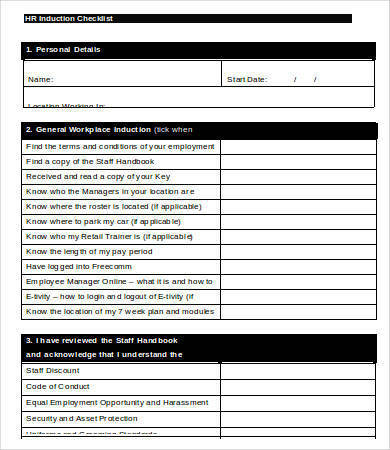 Induction checklists are often used in the workplace to ensure that a new employee is introduced properly to the company, especially to the group where they belong. There is no telling that this tool is important. Induction checklist samples in different varieties are provided in this article to help you further understand what an induction checklist is when it is used, and the many advantages it offers to its user. 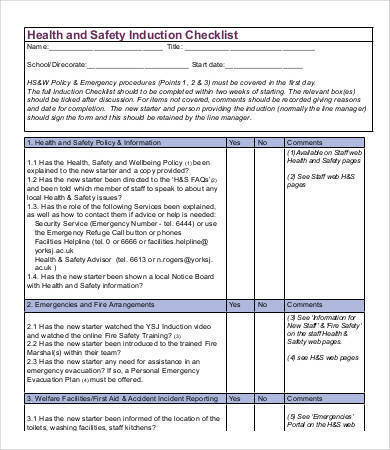 What Is an Induction Checklist? Induction means the act of introducing someone into an organization or a position. When inducting someone, whether they are a staff or an employee in a particular company or organization, they are being introduced not just to the people within that company or organization, but they are being introduced to the duties and responsibilities that are related to the job that they are going to work in. Often, an induction is regarded as some sort of formal or informal training of a new office staff or employee so that they get to know the things that happen and the things that they need to do within the workplace. Ypu may also see event checklist templates. 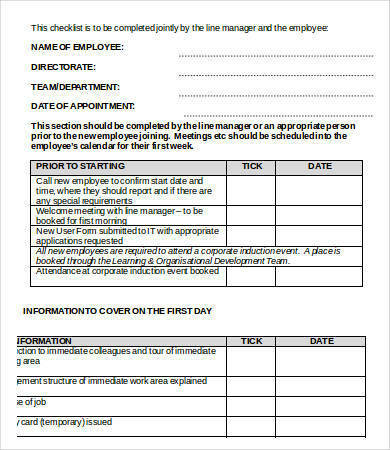 With that being said, an induction checklist serves as a guide for every inducted employee, employer, or human resources department. This is because they contain a list of steps and activities that a newly inducted staff or employee needs to do in the workplace. The list of activities or tasks also needs to be consulted by the manager in charge of the employee or the human resources department to ensure that the employee has covered those tasks assigned to them. If you have induction checklist samples, what would you do with them? The easiest and fastest answer that one would come to think of looks at it and throw it away. This is actually how we see and treat things. They’re just samples anyway. You can’t do anything about it. Well, that is where you got everything wrong. 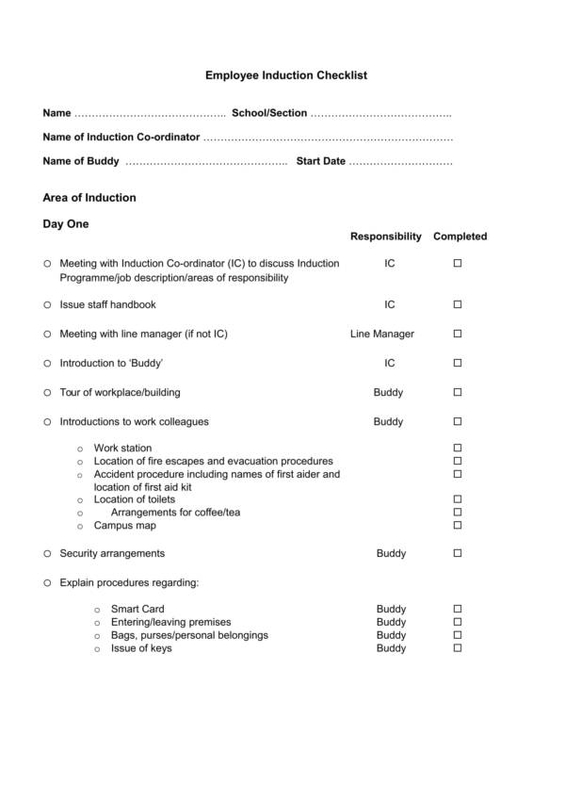 Induction checklists are pretty useful, especially in the workplace. Below are some of its uses. You may also see weekly checklist templates. 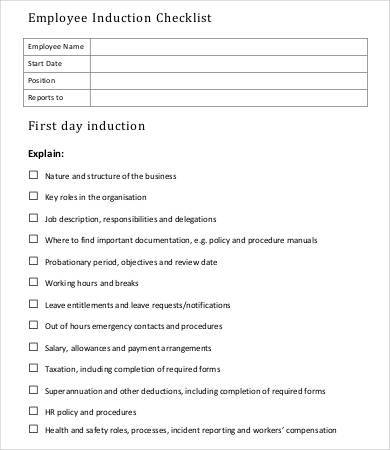 An induction checklist is used by a manager and by the newly inducted employee to ensure that all the tasks needed to be covered are done in a given period of time. A new hire checklist is somewhat similar. 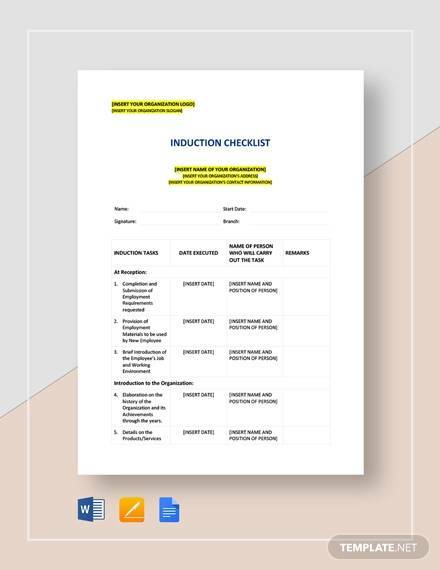 An induction checklist samples will serve as a guide and as a reminder for those people assigned the tasks of making one. 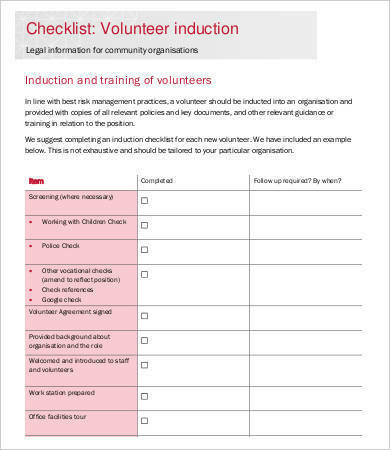 The guide will help them build and compose an induction checklist of their own. 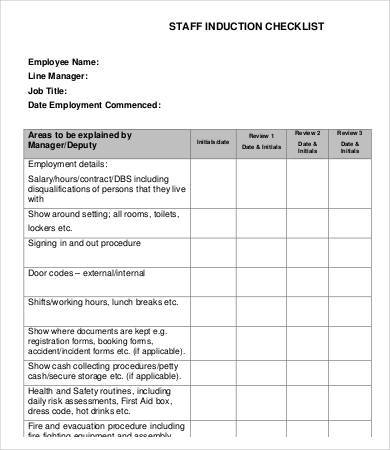 An induction checklist sample can also be used as one’s own checklist, especially if the involved tasks are similar to that of the tasks in one’s workplace. 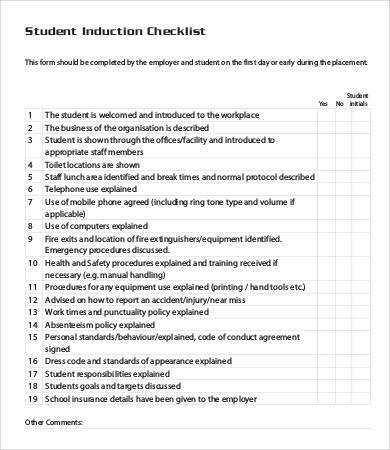 There are different kinds of induction checklist samples that are available online, not just employee checklists samples. With different varieties to choose from, you will surely be able to find a sample or a template that best fits your needs. 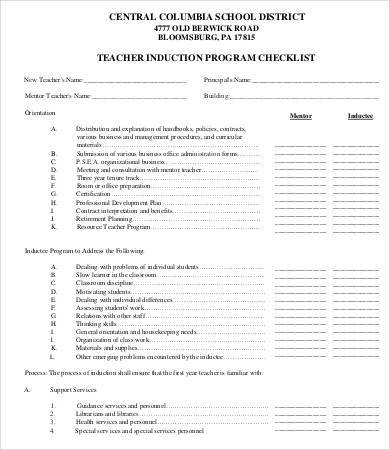 An induction checklist template shows a complete list of the tasks that need to be covered or completed, as well as which tasks are already done. With the use of an induction checklist, the newly inducted employee will be able to understand clearly their role and responsibilities within the company or organization so that they know where they stand. The checklists help in the evaluation of a probationary employee who is nearing his regularization period. This is because it is one of the tasks listed in the induction checklists. You may also see word checklist samples. 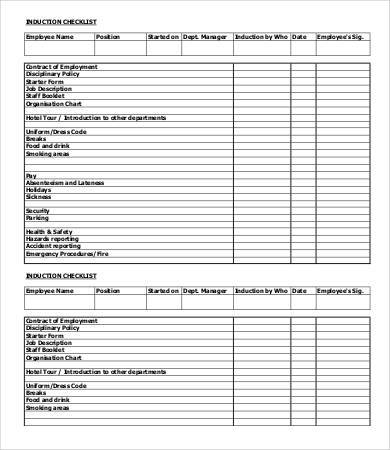 Aside form induction checklists, we have a variety of checklist samples and templates on our website that you might be interested in. They are training checklist samples and pre-employment checklist samples and templates, to name a few. Checklists are quite famous because of their usefulness and effectiveness. But there are still a lot of people who insist that it’s not as good as we say they are. If you are one of those who people who are still not convinced about checklists, then here are some advantages about using checklists that you need to know. You may also see equipment checklist templates. You can be organized and stay organized with the use of a checklist. You can list all the things that you need to take care of in a checklist, that way you can do all the tasks that you need to do. You can arrange the tasks in the order that will help you maximize your time and do more. 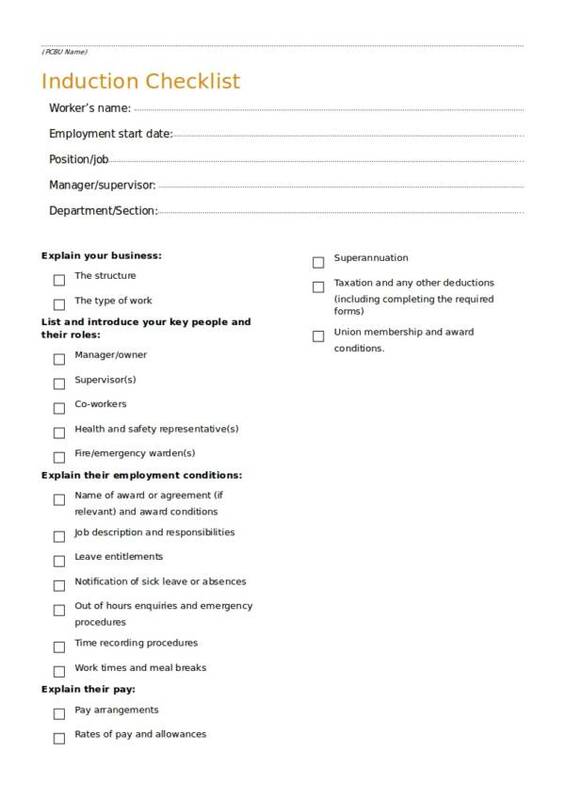 You may also see new hire checklist samples. It helps you save time, energy, and brainpower. Because you have all your tasks listed in the checklist, you no longer have to spend a couple of minutes to a couple of hours thinking of what to do next until you are frustrated. This also means you are saving your energy and brainpower on more important things. You may also see sample project checklists. A checklist allows you to manage your time well. If you know the list of things that you need to do, you definitely won’t be lying there doing anything. You would obviously need to stand up and get moving. It motivates you to do more. There is nothing more rewarding than being productive and being praised for doing so. A checklist keeps track of important deadlines for projects or important business meeting appointments. It is easy to prioritize tasks with the use of a checklist. You may also like daily checklist samples. A checklist reminds you of the things that need to be taken cared of and also tells you of the things that you have already completed. A checklist can be used for just about anything. 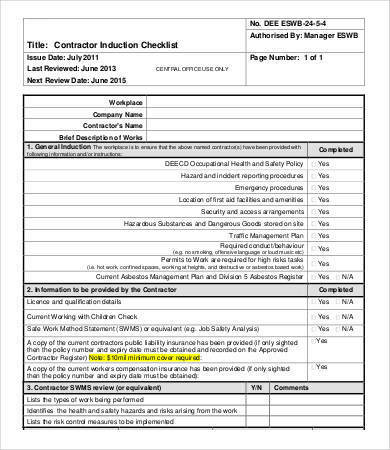 It can be made into control checklists, compliance checklists, and construction checklists. As you can see, there are definitely a lot of advantages with using a checklist. This also proves that it is definitely a very useful tool. Checklists are pretty useful no matter what type it is or for what reasons it is used for. What matters is how it is being used. So that you can make the most out of your checklist, here are some tips that can help you use them effectively. Always put a mark on the tasks that you have already finished. Doing so will help you avoid the possibility of repeating the task. Marking accomplished tasks will also show you have you have fared for the day and this will motivate you to do more. You may also see college checklist templates. It is best that you start your checklist with only a few and attainable tasks. Don’t rush with being able to do a lot in a day. That will come naturally with practice. Writing a lot of tasks that you might not finish in a day will only demotivate you and deem your checklist ineffective. Always prioritize your tasks. Make sure that you have the important tasks on top of your list and the least important tasks in the middle or at the bottom of your list. This is so that it will be easy for you to check which tasks to do first. You may also see control checklist samples. Make sure to do all of your listed tasks on time. Do not leave out tasks intended for today to be done the next day. If this goes on, then you will have more tasks piled up every single day and it might come to the time when you can no longer handle them. This will surely end your checklist journey. You may also see home inspection checklist. Write your checklist before you actually use it. You can make a checklist on a daily, weekly, or monthly basis. This way you can carefully think of the tasks that you need to include and which tasks can be skipped. Use blank checklist templates so that it will be easy and convenient for you to write your tasks. 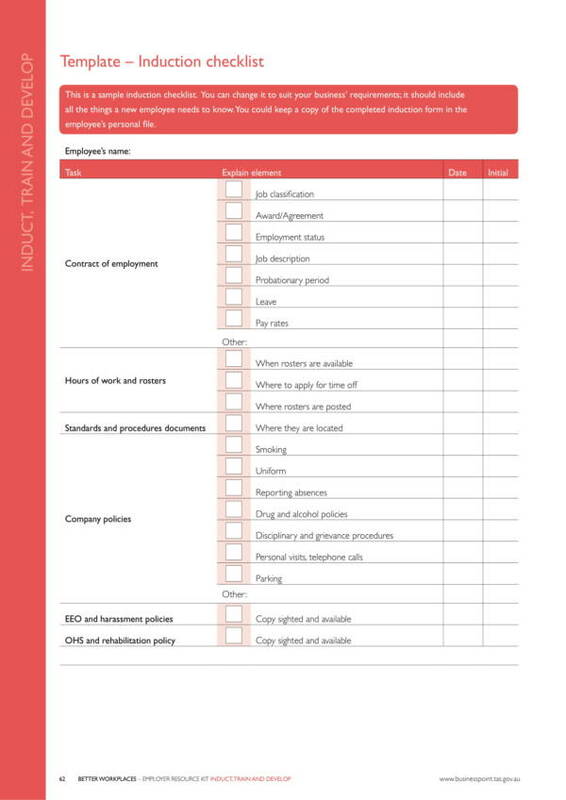 There are a lot of checklist templates available online for free! There are also different varieties that you can choose from so you are sure to find what you are looking for. With all the information we have provided, you are now ready and equipped to create your own checklist.